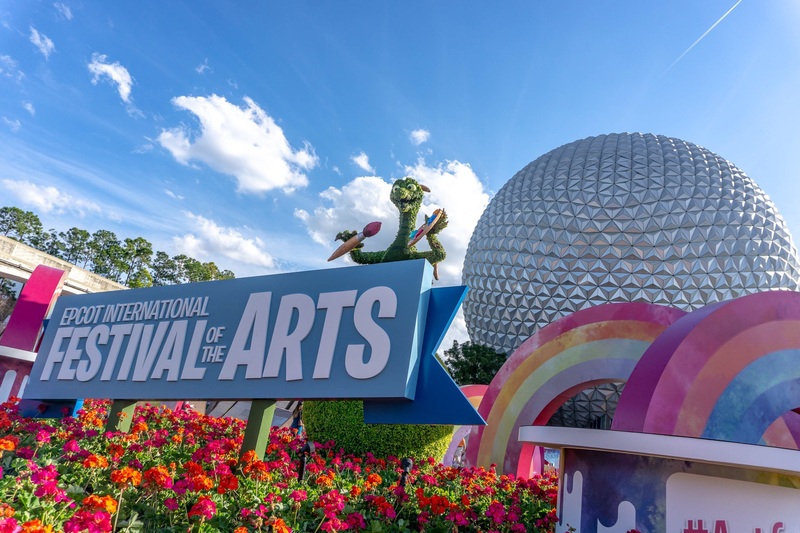 Now in its third year, the 2019 Epcot International Festival of the Arts celebrates artistic endeavors across many disciplines – and lucky for us, that includes the culinary arts! 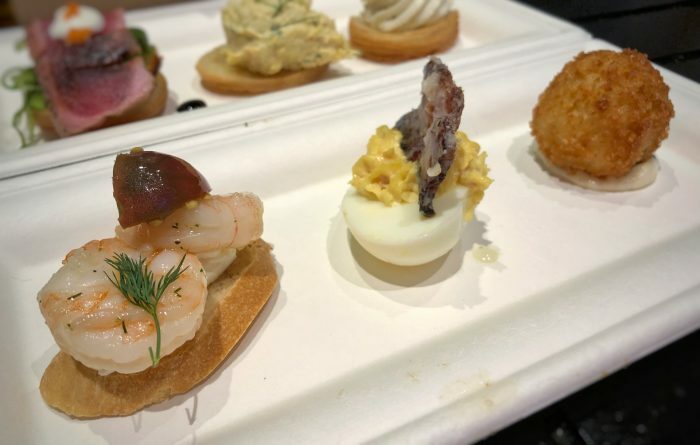 Recent years have featured innovative and creative displays of technique and flavors from the festival booths, and this year, with a few new booths and many new dishes, I was looking forward to seeing the festival take even more steps forward in the food scene. Overall, the Festival of the Arts is finally settling into its groove, but there were more misses this year than I’ve noticed in years past. Italy’s L’Arte di Mangiare, America’s The Artist’s Table, Decadent Delights, and Morocco’s Mosaic Canteen are all easy skips in this year’s festival; there are just too many other good dishes to try elsewhere. On the bright side, Deconstructed Dish, Pop Eats, Germany’s Cuisine Classique, Japan’s Takumi Table, and France’s L’Art de la Cuisine Francaise continue to bring solid dishes to the fore, with interesting flavors and presentations mixing to highlight the best this fest can do. Elsewhere, you’ll find hidden gem dishes at Masterpiece Kitchen and Mexico’s El Artista Hambriento (as well as at Refreshment Port, where lobster nachos are all the rage right now). Check out my rundown below of each booth’s offerings, along with my picks and skips to help plan your trip to this year’s festival. As always, click on any photos to enlarge them and get an up-close view of each dish. 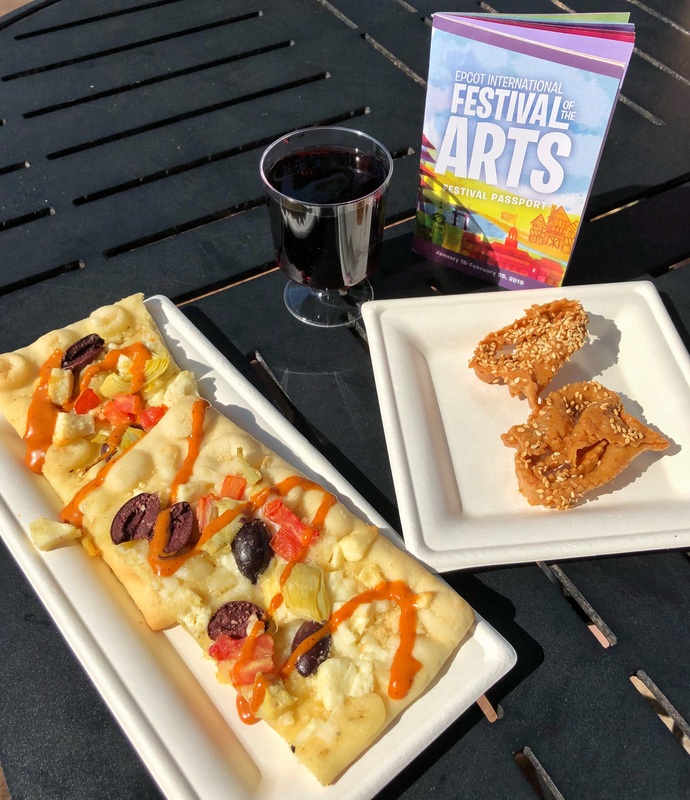 The Painter’s Palate booth, located in the Odyssey Festival Showplace, still shiny and spiffy after its recent renovation as a festival center, adds one dish to its menu this year. Unfortunately, both days I visited the festival during opening weekend, technical issues prevented me from trying the Smoked Salmon and Cream Gateau. It sounds pretty innovative and perhaps worth a shot, but the trio of savory cronuts remains my top pick – the gimmick of the cronut has saturated Disney food thoroughly by this point, but the quality flavors of the creamy chicken salad and spicy tuna toppings for two of these bites (plus, who doesn’t love cheesy, garlicky anything?) is enough to keep this as a must-try for me. At this booth (and all booths), I’d skip the white chocolate paintings. They’re cute to look at, but even in the dead of Florida winter, they quickly disintegrate outside, and they’re really just white chocolate at the highest possible cost – there are too many other great desserts (kid-friendly, too!) to go for these. 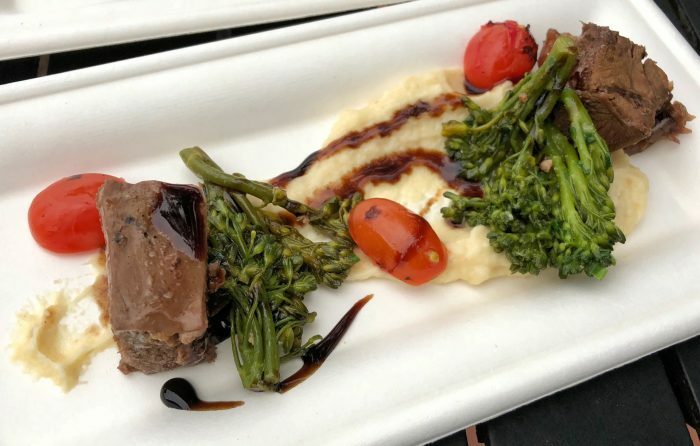 The Deconstructed Dish is better described as Fussy Family Favorites, and honestly, if that doesn’t sound up your alley, your best bet is to skip this booth in favor of a few others we’ll get to later. 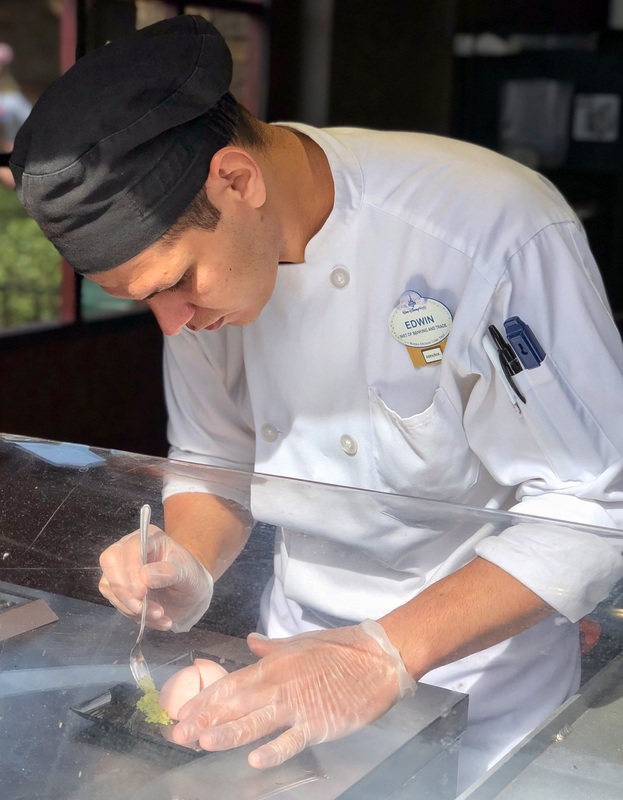 I happen to enjoy this booth’s offerings, on the whole – familiar flavors wrapped in a new package are a fun way to jump in to “fancy” food, particularly for kids and picky eaters, and bonus: because these dishes are deconstructed, if there’s a part that you don’t want to eat, it’s pretty easy to avoid. My pick for this booth continues to be the Deconstructed BLT with Crispy Pork Belly – really, how do you say no to pork belly? 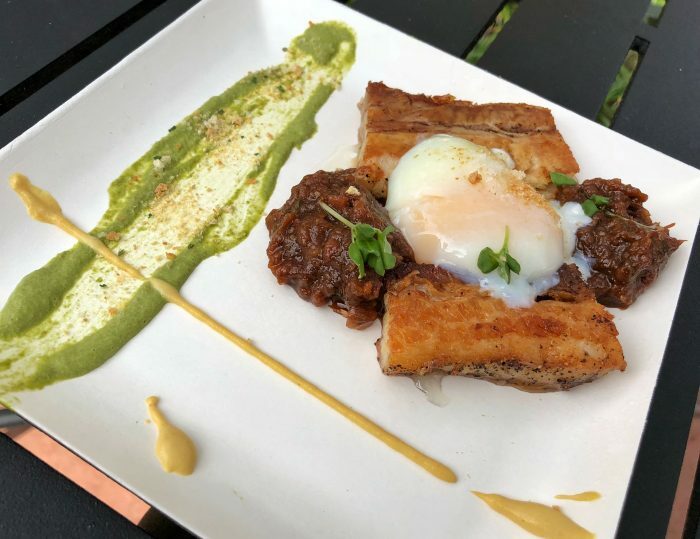 One caveat for this dish is to try to order it during a busy time of day – you definitely want a super-fresh version of this, as it makes the pork belly and the poached egg shine best. I still wish this dish had a little crouton or breadcrumbs at the very least – a true BLT is loaded with crunchy textures and this misses that altogether, but the salty-sweet juxtaposition of the bacon and tomato jam is can’t miss for me. 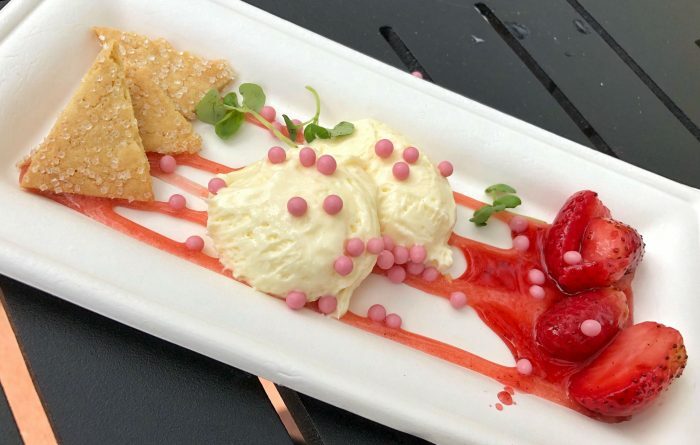 The Deconstructed Strawberry Cheesecake is a skip, if only because of its simplicity; basically, this dish is cheesecake mousse with strawberry topping you’ve had a million times and an unremarkable sugar cookie. It is delicious, but it is not innovative unless you are a particularly picky eater. The dessert-centric booth returns this year with an honestly underwhelming selection of treats. 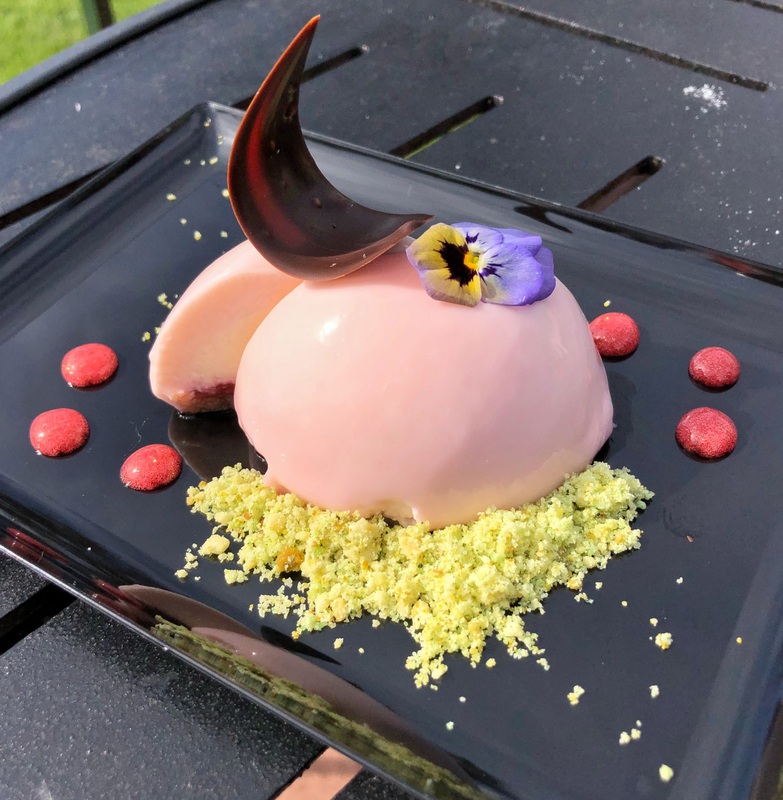 The white chocolate and purple sweet potato mousse was a rave for me last year, but I’ve softened on it since – upon sampling it again the first festival weekend, I found little flavor except “sweet” present, and no real focus. The chocolate and peanut butter dessert needed more of both flavors, and less stale pretzels all over the plate. The lemon-blood orange tart was the best out of the three desserts I sampled, but it lacked the true tart punch I’d expect from those two fruits, with the blood orange playing second fiddle to a too-sweet and dense crust. Overall, I’d skip this booth altogether and stick to other desserts. Pop Eats is always one of my favorite booths, and this year is no exception. 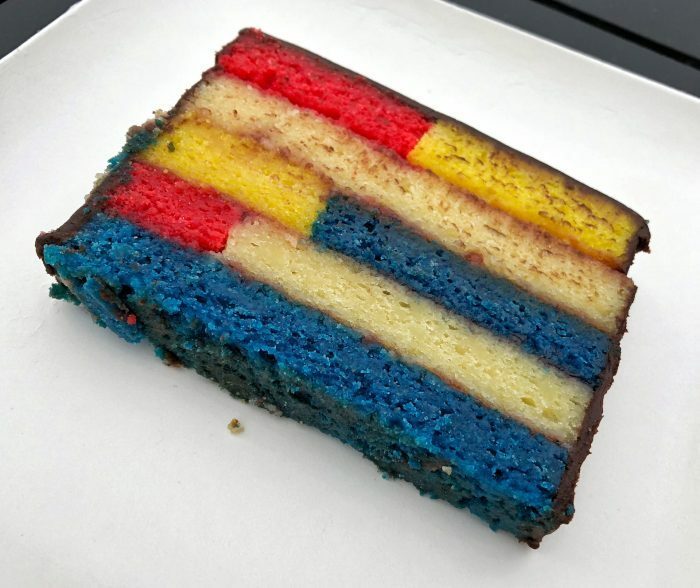 I love the sweet-tart-richness of the decadent Almond Frangipane Cake, artfully crafted to look like a Mondrian painting (how cool is that?!). 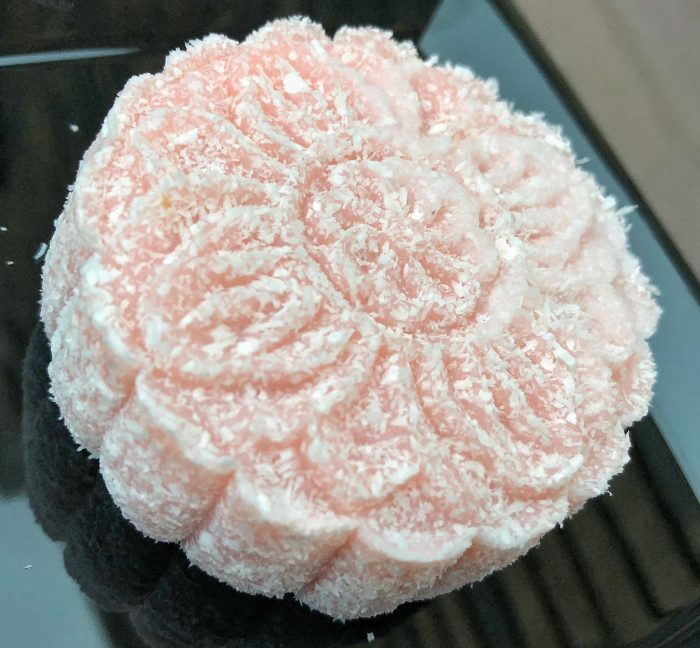 Nearly every time I drop into the festival, I find myself grabbing a slice of this cake, which is both style AND substance wrapped into a few small bites. Also a pick? 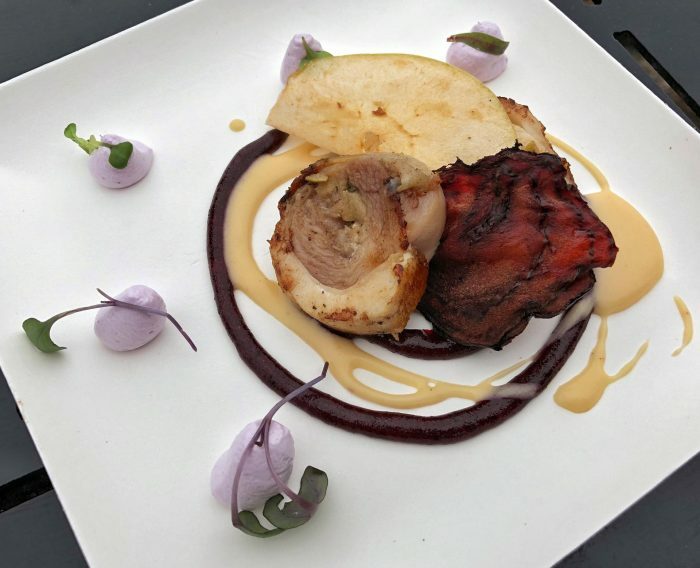 The chicken roulade, which combines fall and winter flavors beautifully. I still can’t believe this dish is being served in a theme park – it’s as complex in execution as it is in flavors, balancing all the sweet fruits and tender chicken with the sage and brie perfectly. 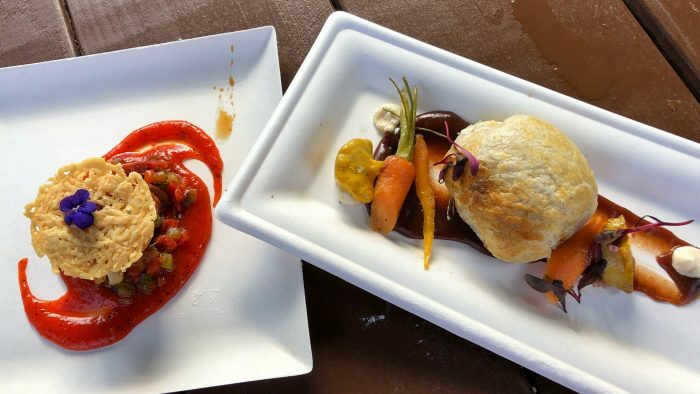 Both of these dishes are definite picks to give a try. 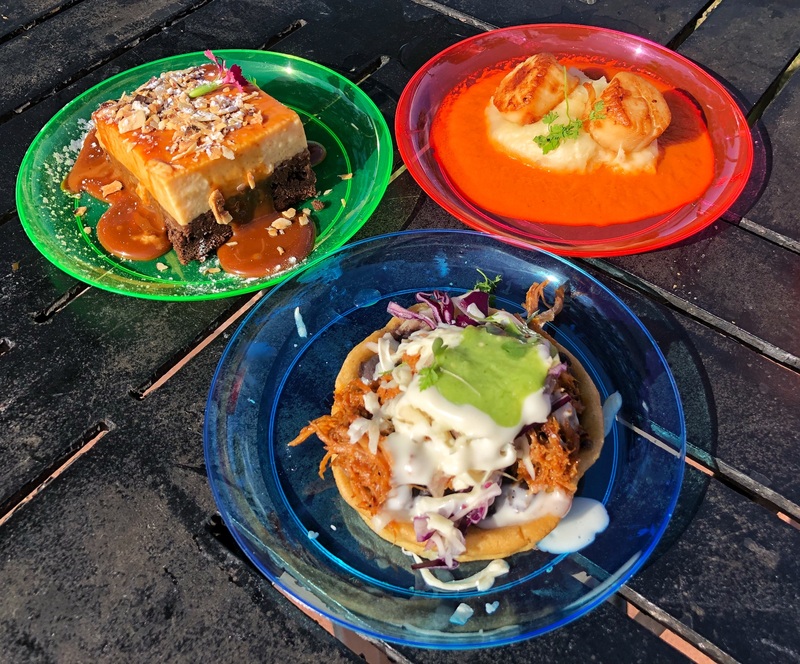 Mexico is always hit or miss in festivals these days, and I’m happy to report that at least two of their three dishes are picks for me! The seared scallops with ginger-habanero sauce and yucca puree really hit the spot – we hit this booth last during my first day of sampling, and after some underwhelming scallops from The Artist’s Table booth, these scallops really sang. Tender and perfectly seared without being chewy and overdone, these two smaller scallops sat atop a creamy yucca puree (mild in flavor, with a texture much like mashed potatoes) and a tangy sauce that only slightly hinted at the habanero within. Don’t shy away from this dish if you are spice averse – I think it’s still pretty accessible and tasty enough to sample. 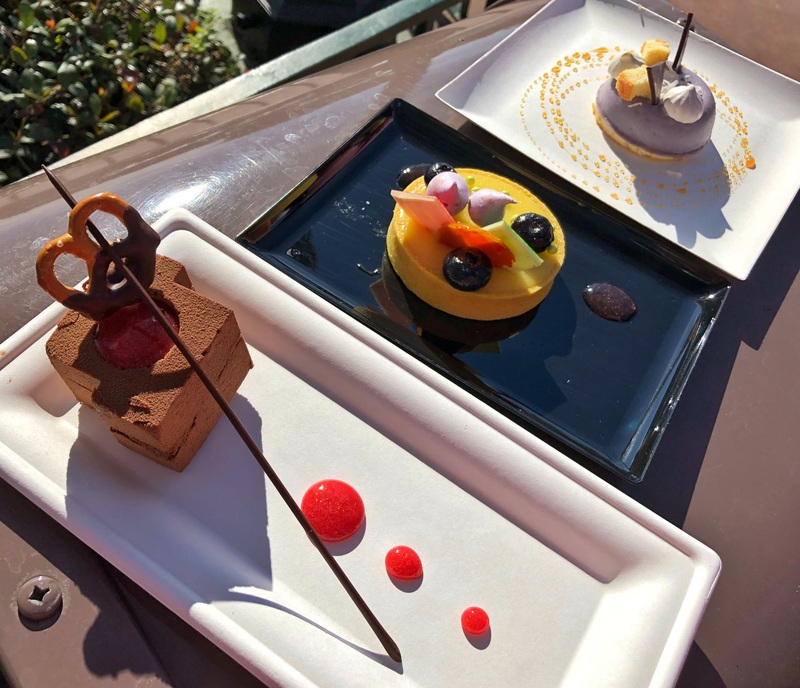 Also a pick is the returning chocoflan dessert, slightly updated this year. The cake underneath was a tad dense on my portion, but the dark chocolate flavors with the caramel custard is really hard to pass up. It’s also worth noting that this is one of the few dishes where the portions really make it shareable – hard to come by in Epcot festivals these days. I was underwhelmed by the sopes de chilorio, unfortunately. I think the pork could’ve used an injection of flavor, and otherwise everything was very mild and inoffensive, which makes this a skip in my book. The chewy mooncake continues to be one of the prettier and most fun desserts at the festival; if you like fruity-sweet flavors, this is a definite pick for you! I would certainly skip the dragon and phoenix – portion sizes alone (with 5 noodles and 2-3 shrimp per plate) made it a dish I was not willing to wait 30 minutes in line for during either of my festival visits, particularly when both of these items are served inside Nine Dragons on a regular basis. I’m intrigued by the plum-infused cherry tomatoes, and it looked to be a decent snacking portion, but the booth was out of them the second time I visited after skipping out on my first trip. I’ll have to return to the festival and report back if they’re worth the effort of this always long line. 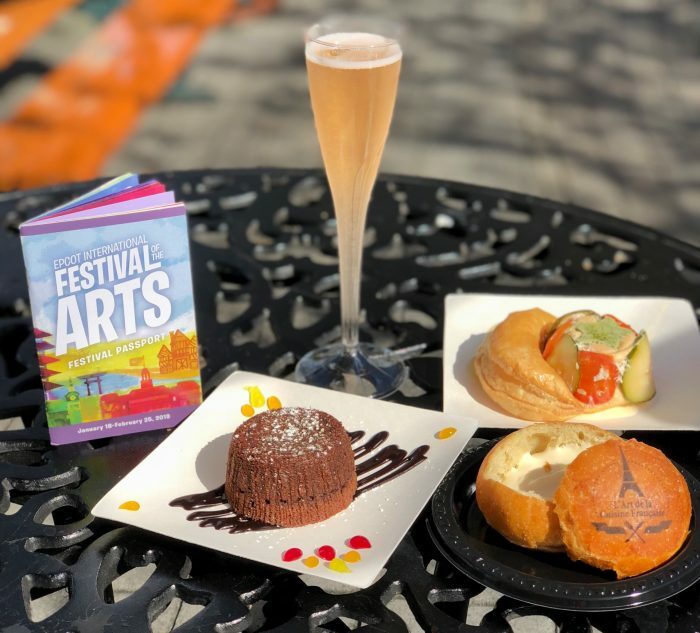 Two of my top festival picks from last year, the beef short rib and Saint-Honore tart return, continuing to reign supreme over many other festival offerings. 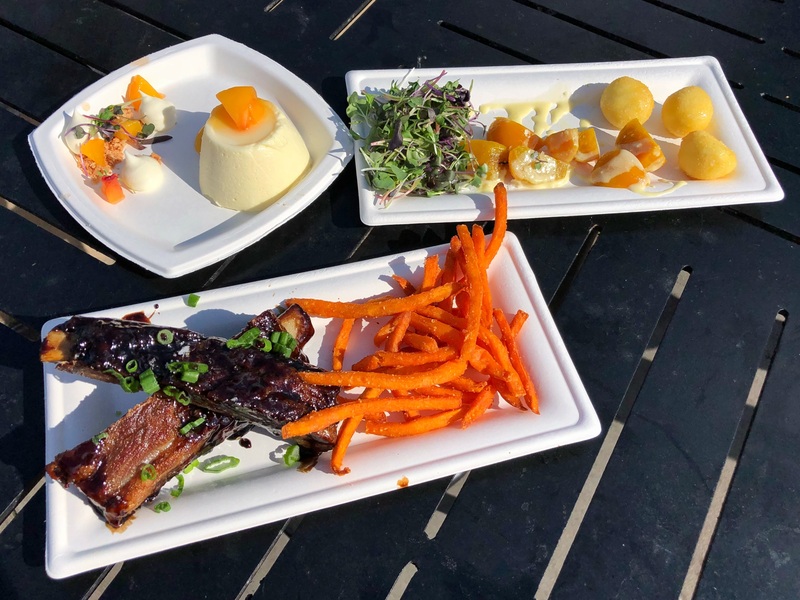 The short ribs are both decadent and accessible – picky-eaters would be hard pressed to pass up a bite of good ol’ pot roast, while the dish still satisfies more adventurous diners, too. 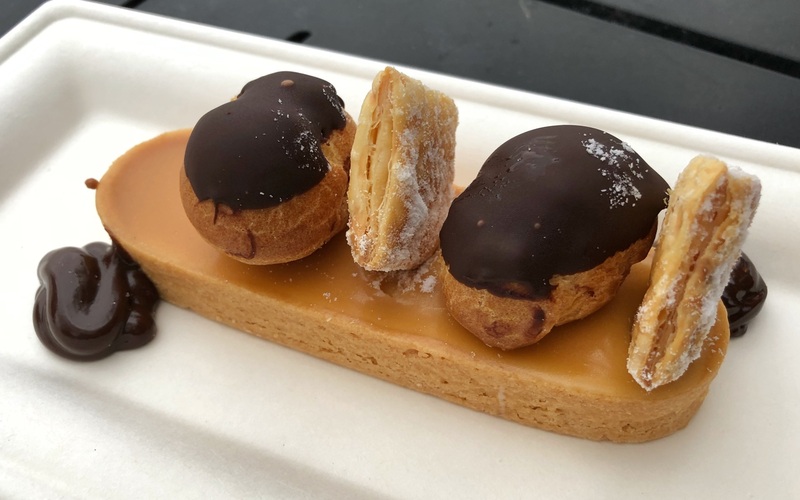 The Saint-Honore tart is a caramel lover’s dream – creamy, crunchy, with slight hints of salt to elevate the flavors laced throughout, I could eat this every festival visit. Italy’s food booth continues to divide festival fans – I was enthusiastic that their offerings would be great this year after those tasty ricotta fritters from last year and a good showing at last year’s Food and Wine festival, but alas, it was not to be. In short, the booth is entirely a skip. The roasted beet salad was covered in crunchy kosher salt to the point of being inedible (though the goat cheese fritters were nicely fried, still not enough to recover the whole dish). The ribs were… odd. Most of our party commented on how the whole booth and surrounding area smelled like soy sauce, a rather odd flavor to be coming from the Italy booth. The meat was a bit paltry and mealy, and did indeed taste like soy sauce (I imagine this is what burnt balsamic tastes like). The orange honey mousse was largely flavorless – it was like eating air; very expensive air. I wanted to like both of these dishes, but neither was appealing enough to continue eating after even one bite. The beef wellington was both mushy and tough, a remarkable feat, and had little to no mushroom or fennel flavor anywhere on the plate. As mentioned earlier, the pan-seared scallop here was vastly inferior to the Mexico booth’s scallop dish; this was tough, over-cooked, and lacking any flavor, alongside a flavorless red pepper sauce and a relish with chorizo that also did not have flavor (do you know how hard it is to make chorizo taste like nothing?). Unanimously, my dining party thought the only good thing about either dish was the parmesan crisp atop the scallop, which I think makes this booth a resounding skip. After two very disappointing booths, the Japan booth will cheer you up. 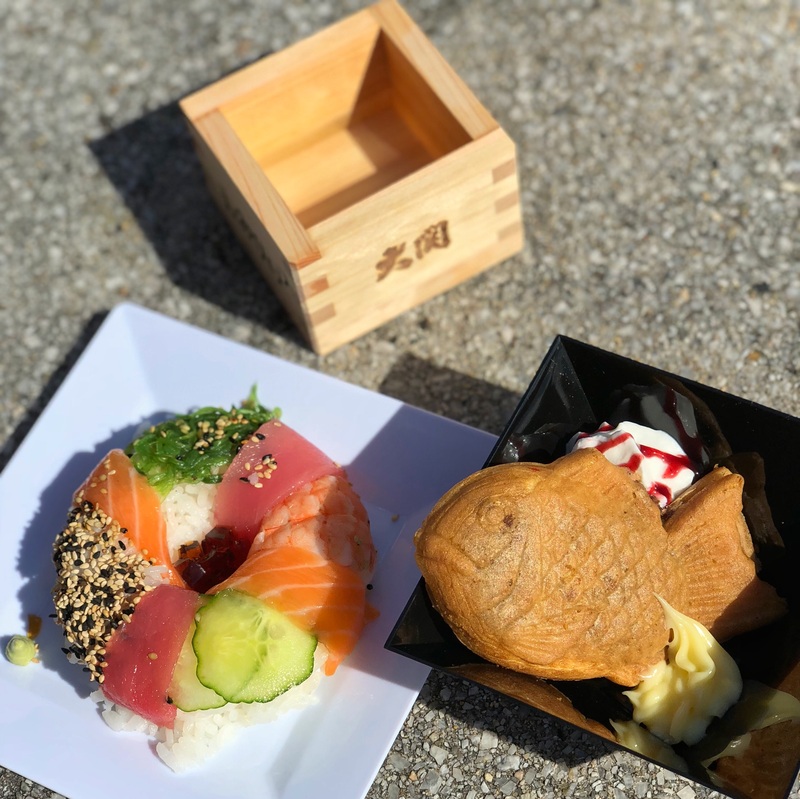 Both the taiyaki and the sushi donut are must-try dishes, in my opinion. 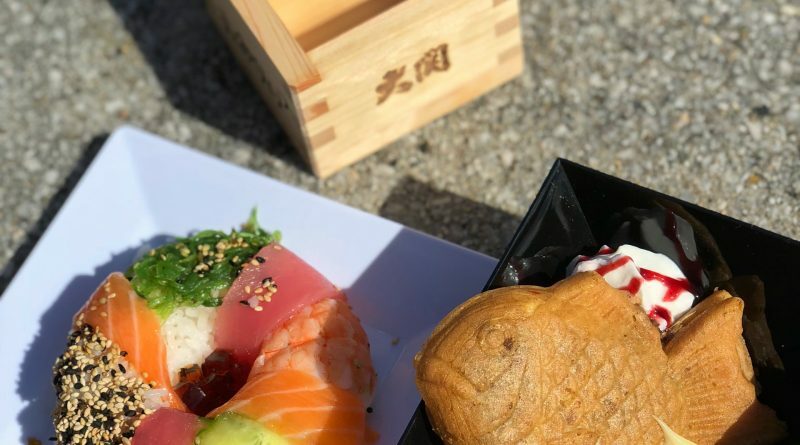 The taiyaki is a fun, traditional Japanese dessert beginning to make waves here in the US of late – sweet pastry, almost waffle-like in texture, filled with sweet red bean paste and a tiny dollop of whipped cream is sure to please most anyone who tries it. The sushi donut is an equally-successful crowd-pleaser, with one caveat – you’ll likely have to wait a while to get one. During the first festival weekend, I ended up waiting about 15 minutes for my order, as they’d run out of fish (the sushi chef inside the booth joked they had to go catch some more). It was, however, entirely worth the wait. It may seem like a lot of rice, but this is about the equivalent of a 6 or 8 piece roll in size, with a decent amount of fresh seafood, to boot. The citrus-soy gelee served in the middle of the donut means you don’t even have to douse this in soy sauce packets from the booth to hit the spot. 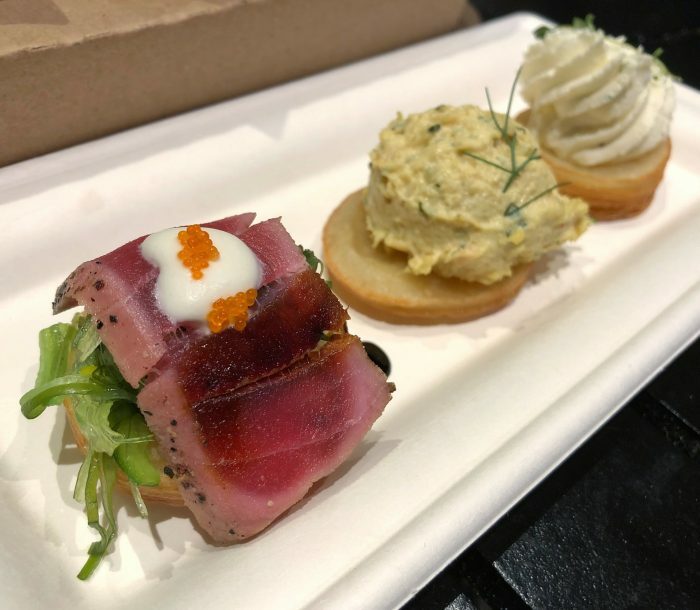 Last year, I highlighted the hummus trifle (known this year as the spiced beef with hummus), and was pleasantly surprised at how palatable it was. I was disappointed to find that this year’s portion was a bit smaller and not worth the asking price, so I instead sampled the Mediterranean Flatbread in hopes of being wowed – in short, I was not. This dish is a definite skip – it’s a large portion, overall, but it’s mostly pita bread with very little toppings on it. The best part of the dish was the delicious sauce drizzled on top (the very same from the hummus fries famous from festivals and Spice Road Table). Also a skip, and probably one of my least favorite dishes of the day, were the chebbakia. I’m not sure if I disliked the texture of these because they were stale, or just not my cup of tea, but they were unappetizingly chewy and didn’t taste like much of anything. Additionally, this dessert is a whopping $7 for essentially 4 bites of food, which wouldn’t have been a good value, even had they been tasty. Now, I’m not one to complain about cheese and bread, but I did find the warm creamy brie dish to be a little more style over substance than I wanted. Don’t get me wrong – the cheese was excellent and the bread bowl, even slightly stale, was a great delivery vehicle, but I wanted a slice of crisp green apple or some grapes to help offer a little sweet or acidity to the cheese party. The salmon dish is slightly changed from last year, with the fish presented in a terrine rather than playfully draped in the puff pastry itself. The texture definitely improved as a result, making this a more palatable option for me, though this is certainly one of the fussier dishes of the festival and not really meant for pickier eaters. The true crowd pleaser, and honestly probably one of my top festival picks overall, has to be the molten chocolate cake. This was a masterpiece in chocolate flavor, hitting every deep, dark note you want from something that is meant to be rich and gooey. Is it original? Absolutely not. Is it innovative? Nope. But it’s darn tasty, and that’s enough for me. Masterpiece Kitchen continues to be a consistent favorite for me, with the rich and earthy wild mushroom risotto (still served up in reasonable portions) and the well-curated and adorably-presented charcuterie palette. 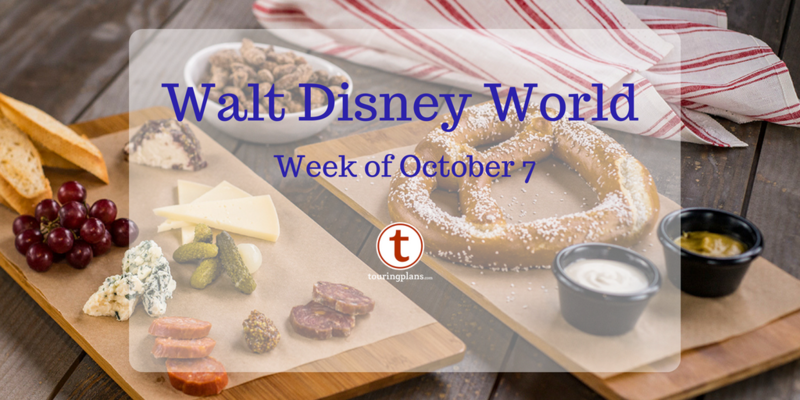 For wine drinkers, this is a great stop, and these two dishes make excellent savory snack-alongs for your sips. I would skip the pistachio panna cotta, though – it’s most gelatin and unflavored sweet air here, which is unfortunate but means you’ll have more room for other better options. 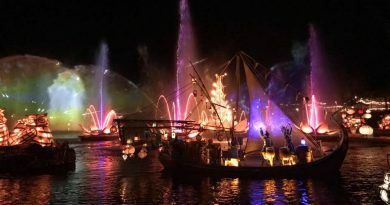 What are your picks and skips for the 2019 Festival of the Arts? Let me know in the comments below! Where is the masterpiece kitchen located? I love Risotto! Hi Nicole! Masterpiece Kitchen is located in the Canada pavilion.